Enjoy a spa day with someone special by requesting our side-by-side couples treatment room. Most of our spa services are available as couples treatments, including body wraps and scrubs, massages, and facials. Perfect for friends or couples, side-by-side treatments allow for time to unwind together. 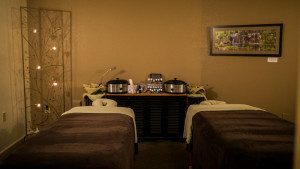 One of our most popular spa packages is the Bilateral Bliss Couples Package – side-by-side 60-minute massages, and 60-minute customized facials in our couples room. Based upon availability, the couples room can be requested at no additional cost upon booking your spa services.